Considered one of the most promising documentary photographers of her generation, Greek photojournalist Anna Pantelia came to City last year to study a Masters and enhance her career prospects. Chris Lines sat down with Anna to hear about her work in photography to date and the path that led her to City. In February this year, the influential photographic agency Magnum Photos announced a ‘30 Under 30’ list identifying emerging photographers aged 18 to 30, with the aim of recognising and providing a platform for burgeoning photographic talent. Among them was City MA student Anna Pantelia. It was the most important thing that’s ever happened to me,” she says. “I could never have imagined this happening – it really means a lot. Magnum, founded in 1947 by some of the world’s leading photographers as an ‘international photographic cooperative’ and owned by its photographer-members, is seen as a standard bearer in documentary photography. For 23-year-old Anna, a ringing endorsement from those she most admires means everything to her. It’s also a clear indicator of her potential and the latest step in her fledgling career. But even before Magnum drew attention to her talent, Anna had already had some remarkable experiences behind the lens. In her home country of Greece, there is a tradition at the end of high school for students to embark on a five-day trip. Anna had other ideas. “I said to my dad, ‘I don’t want you to pay for me to go on this trip. Can you give me this money to put towards a new camera instead?’. Up to that point I had been taking photographs with a pocket camera.” Her father relented and bought his daughter a Canon SLR. Very soon she was producing art photography of a sufficient standard that it was published at a small exhibition in Athens for new artists. Her interest suitably stimulated, she opted to study for a BA in Photography and Audiovisual Arts at the Technological Educational Institute of Athens. Anna expressed her interest but assumed her father’s customer was just making polite conversation. She sent him her cv and subsequently received an application form that she completed and returned. A letter later arrived on 2nd April confirming she had a place at CERN, conditional on passing her final examinations. “I wondered if it was an April Fools’ joke that had been delayed in the post,” she recalls. By chance, while Anna was busy revising in the last few days before her finals, news broke that the Higgs- Boson particle (often referred to as the ‘God particle’ and long considered the missing piece in the jigsaw for physicists trying to understand how the universe works) had been discovered at CERN’s £6.2 billion Large Hadron Collider (LHC). It was one of the most significant discoveries in the history of particle physics, not to mention the biggest story ever to come out of CERN. “The news was everywhere, all the professors were giving interviews on television,” she says, recalling the intense distraction of wall-to-wall coverage for an organisation she was tantalisingly close to working for. Thankfully, she passed and was initially taken on for a two-month paid internship as a photographer. She proved a popular and hard-working addition to the team and was subsequently hired for a further year as Official Photographer. With CERN enjoying a well-earned shutdown after its momentous discovery, Anna had the freedom to visit (and photograph) absolutely everything, including all 27km of the Large Hadron Collider. Nothing was off limits and she was able to put together a remarkable body of work. A friend working at a Greek national agency asked if she could interview Anna about her experiences. Anna agreed to help as a favour and neither of them thought any more of it. The day the interview was published, Anna was on holiday in Israel when she suddenly started getting telephone calls from Greek national television and radio stations. They all wanted to talk to the young Greek woman working at CERN. “I got so much attention and all because of a single article,” she says. “This helped me to understand how the media works. It’s all about whether you are lucky, whether somebody will discover you or write something complimentary about you.” The realisation that she needed to become more media-savvy would soon lead her to City. Anna’s experiences at CERN gave the media a feel-good angle they could work with. The same however cannot be said of the photojournalism she had produced prior to CERN. Having started her degree at the same time as the global financial crisis was enveloping her country, she saw her peers becoming increasingly xenophobic, even racist, as the jobs market dried up and desperation started to creep in. She paints a bleak picture of a country in turmoil. In 2012, during the Greek national elections, the far-right political party Golden Dawn gained unprecedented support, enough for the party to enter the Hellenic Parliament for the first time with 21 seats. Plainly this was not an easy time to be an immigrant in Greece. Anna became acutely aware of the immigrants’ plight. Rejected by the society around them, they often occupied abandoned buildings, living in squalor and unable to find work or the better life they craved. Yet many doubtless viewed their situation as preferable to the one they had fled in their own country. Anna’s skilful eye and compassion allowed her to capture striking documentary images of the immigrants’ predicament. “They were mainly Syrian and Palestinian immigrants of a similar age to me, 20 to 25. These people came from their countries more or less on foot.” Many of those she met had been students in their homeland but were forced to leave. They got around border controls by arriving by boat up a river. They then walked all the way from northern Greece to Athens. While the photographs Anna took of the immigrants were also those submitted to Magnum and subsequently exhibited at The Photography Show at Birmingham NEC in March this year, she had struggled to get Greek media to pay attention to her work. In contrast to the clamour to interview her when she was at CERN, the miserable circumstances of refugees were not a subject the Greek media wanted to present to their audience. Anna, growing somewhat cynical of the machinations of mass media, knew she needed to get under the skin of how media and communication works. She needed to box clever if she was to achieve her ultimate aim of using her photography to make a difference. London seemed like an ideal destination, loaded as it is with media companies, communications agencies and third-sector organisations. And City had the perfect course to offer, a Masters degree in International Communication and Development. She successfully applied and started the course last autumn. 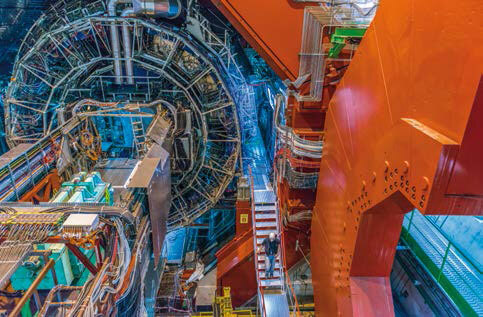 Anna realised while working at CERN that it is communications professionals, not photographers, who plan photographic assignments and make decisions about what gets published. Studying communication would allow her to work for a wider range of employers, from brands to charities and NGOs. After completing a dissertation, Anna will leave City in September equipped with the necessary skills and know-how to build a career around her undoubted talent and an eye-catching cv. However, despite London’s status as a media hub, it’s likely that Anna’s immediate future will be overseas.